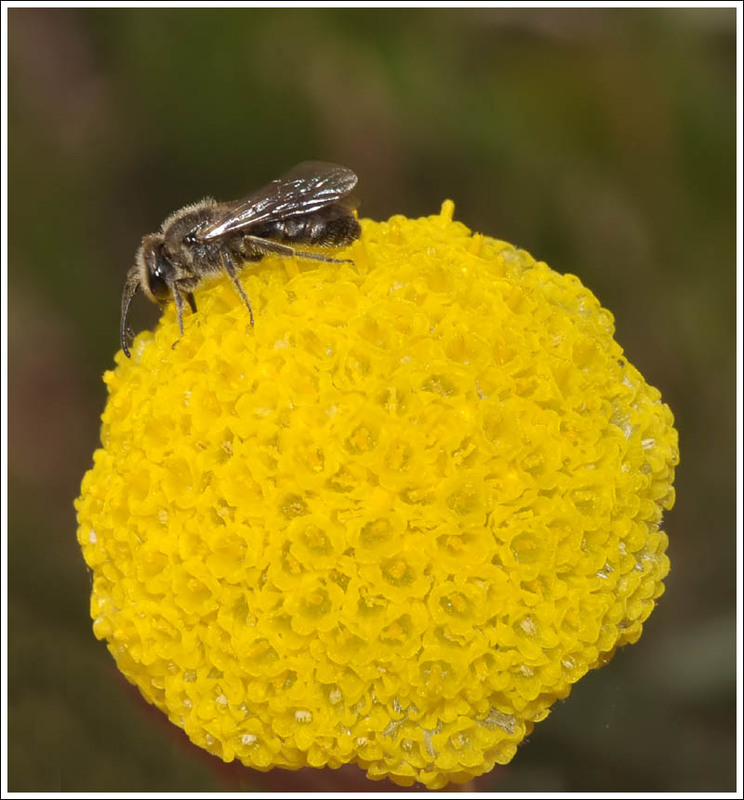 Every spring it’s always good to see the first native bees appear, and on a visit to a patch of native grassland, Lasioglossum lanarium was spotted on one of the few Billy Buttons flowering in the drought-dry ground. 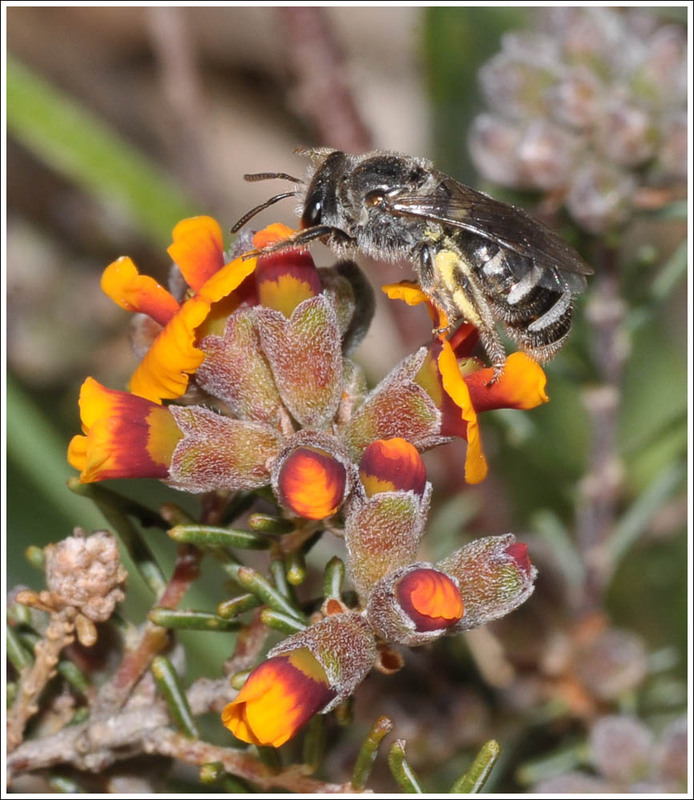 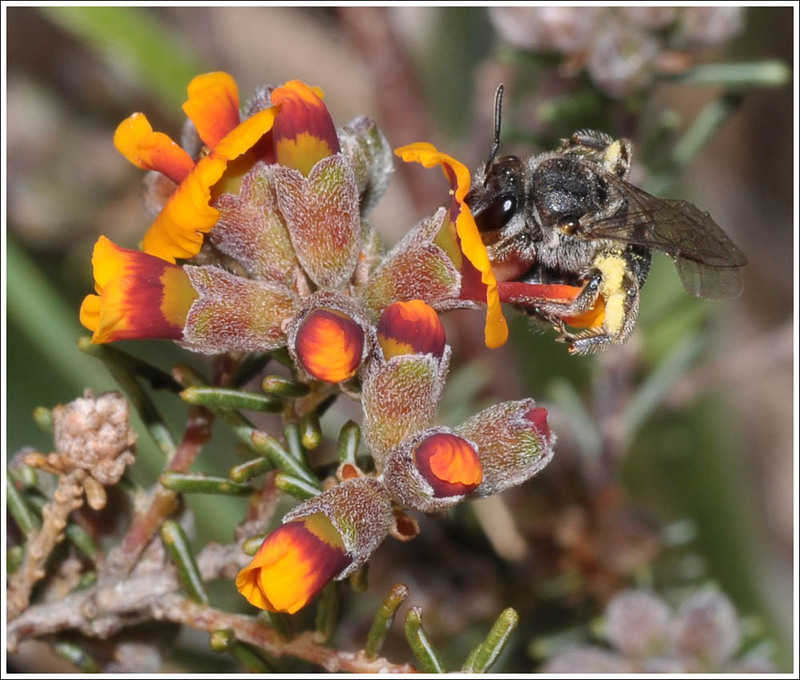 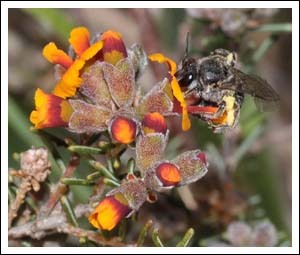 Along the rail trail where the ground is also parched, some of the Grey Parrot-pea is in flower attracting the odd pollen gathering Lasioglossum calophyllae. 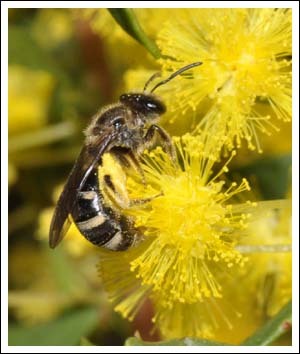 At home in the garden the same species is harvesting its pollen from the Gold Dust Wattle. 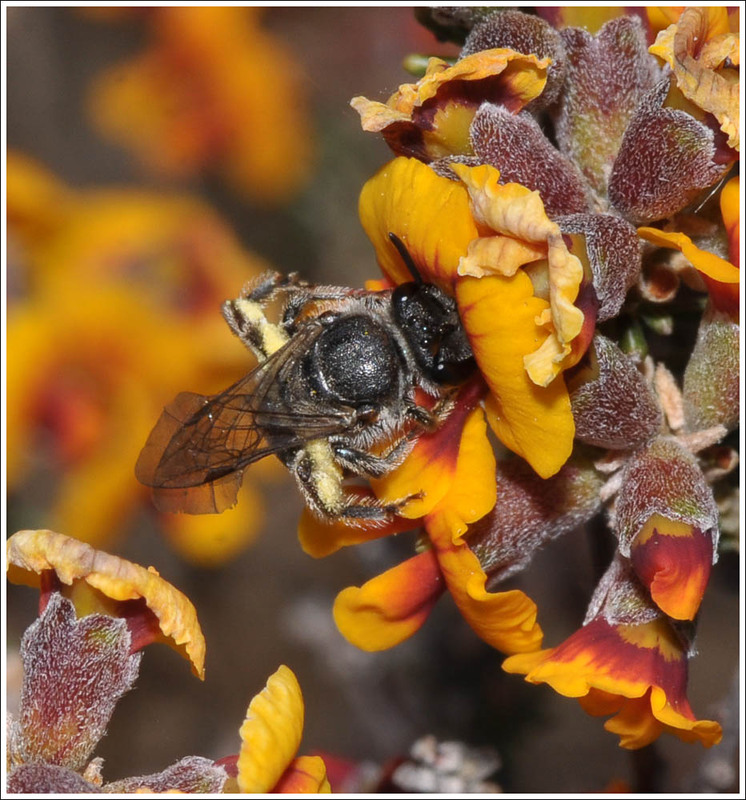 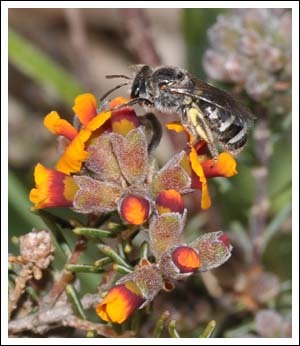 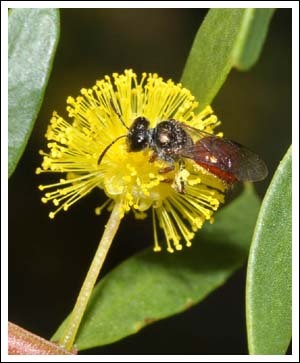 Also busily working the wattle is a third Lasioglossum species, L. (Parasphecodes) hiltacum. Posted on September 30, 2017 by TricarpaPosted in General Nature. 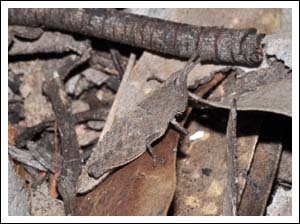 Temperatures have remained cool with the result that invertebrate life is still rather scarce. 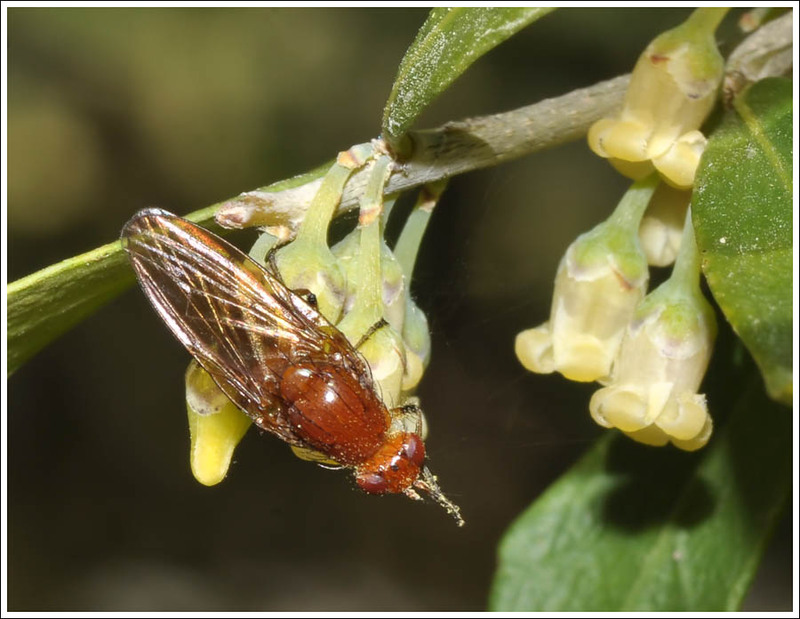 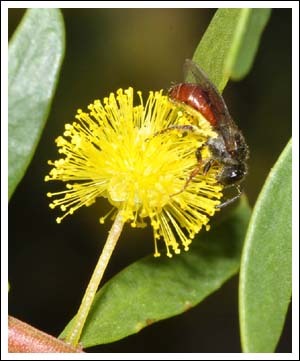 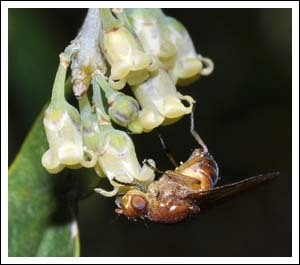 The Tree Violet has been in flower with its sweet perfume attracting the first crop of flies, including a surprise, this Lauxaniid species, a significant pollinator often seen on wattle blossom. 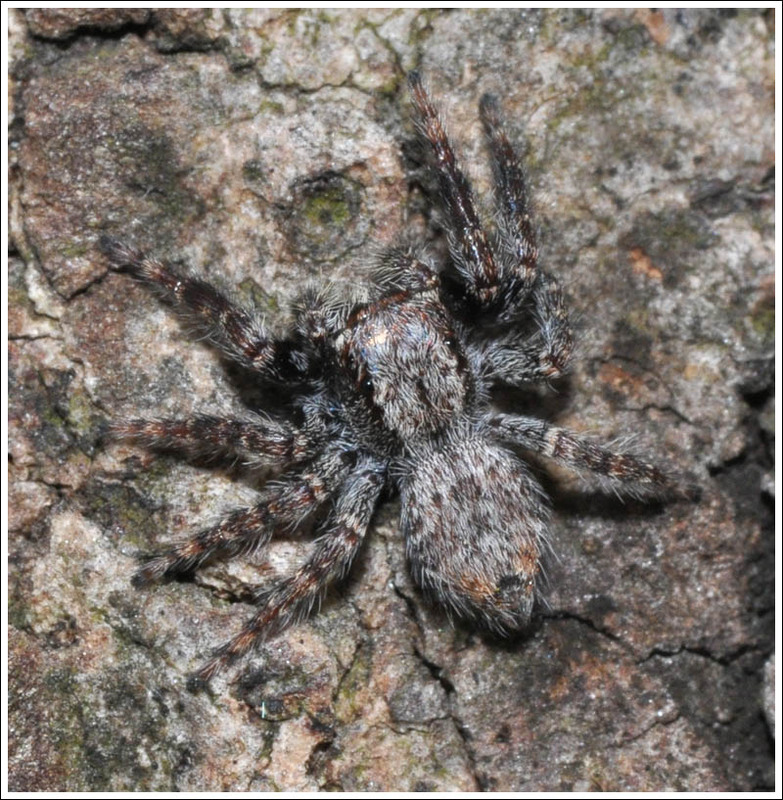 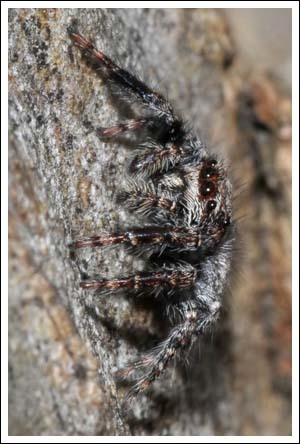 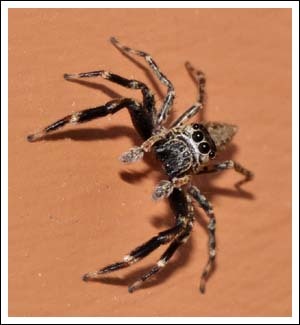 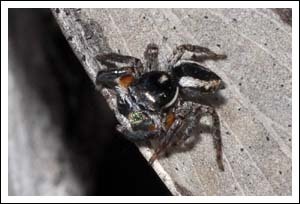 Jumping spiders are gradually appearing, this Helpis minitibunda was roaming a wall. 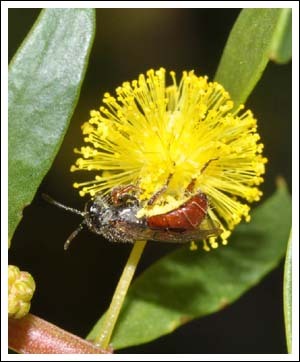 The two garden red gums are favoured habitat for the robust Servaea incana. One one occasion while watching this individual, unfortunately without the camera, a smaller species that strayed too close was engulfed with a lightning leap. 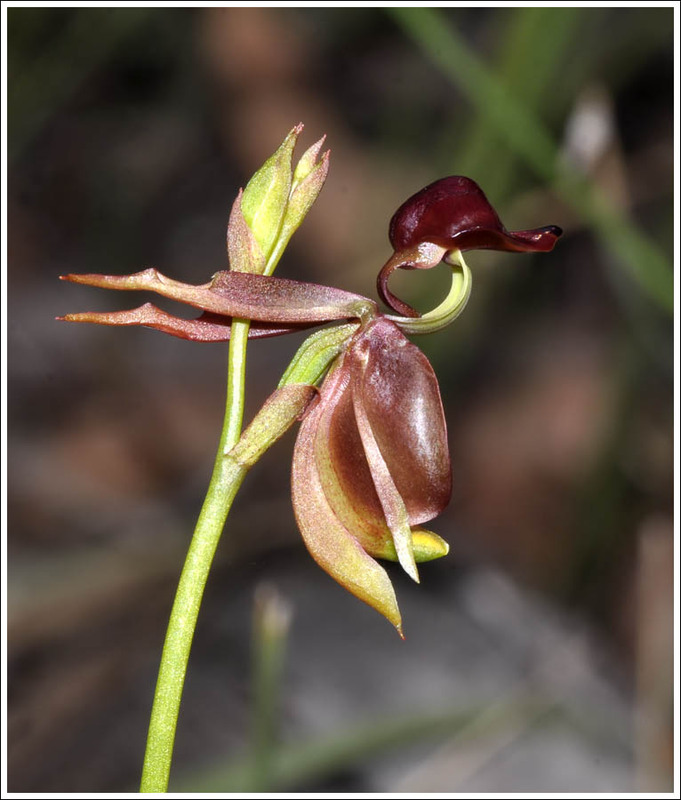 Winter in the local area has been very dry, and the box/ironbark bush is reflecting that fact in the scarcity and condition of the early spring orchids. 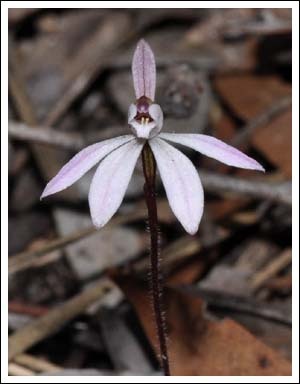 Caladenia fuscata which is usually abundant was hard to find on a recent outing, and those found were small, often only six centimetres tall. A welcome surprise though was an early Flying Duck orchid, Caleana major. 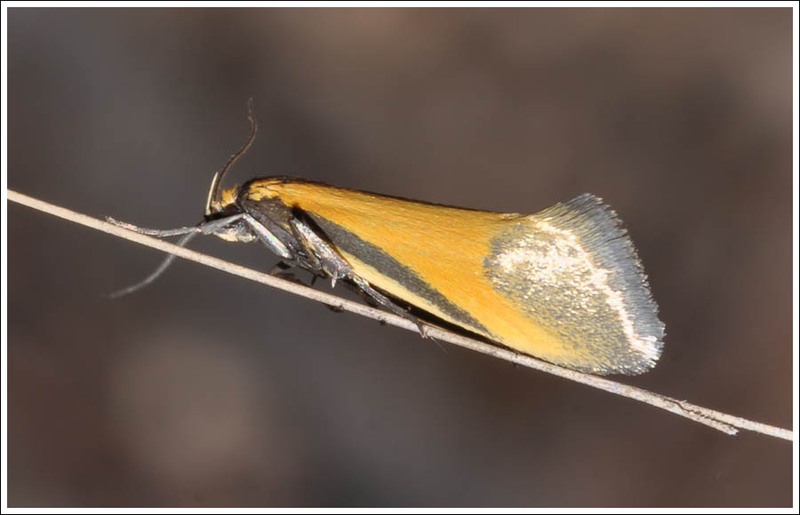 While walking through the bush small day-flying moths were apparent, two were photographed, Philobota arabella, and an as yet unidentified moth perfectly camouflaged to inhabit the leaf litter. 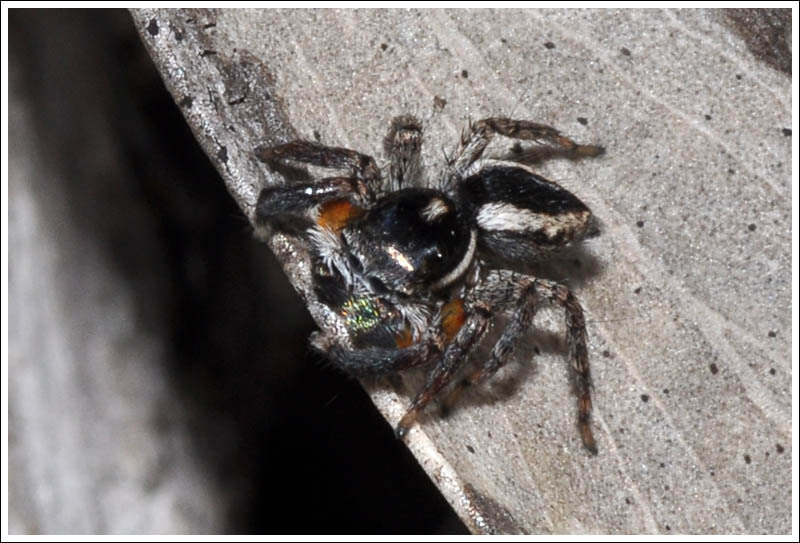 A few jumping spiders were seen, including this male Jotus auripes giving a glimpse of one of his iridescent pedipalps used in mating display. Nymphs of the Gumleaf Grasshopper, Goniaea australasiae, never cease to amaze with their appearance, blending in perfectly with their habitat on the dry forest floor. 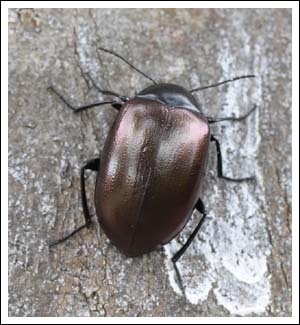 Some species of colourful beetle are hard to photograph satisfactorily due to the shine on their elytra. 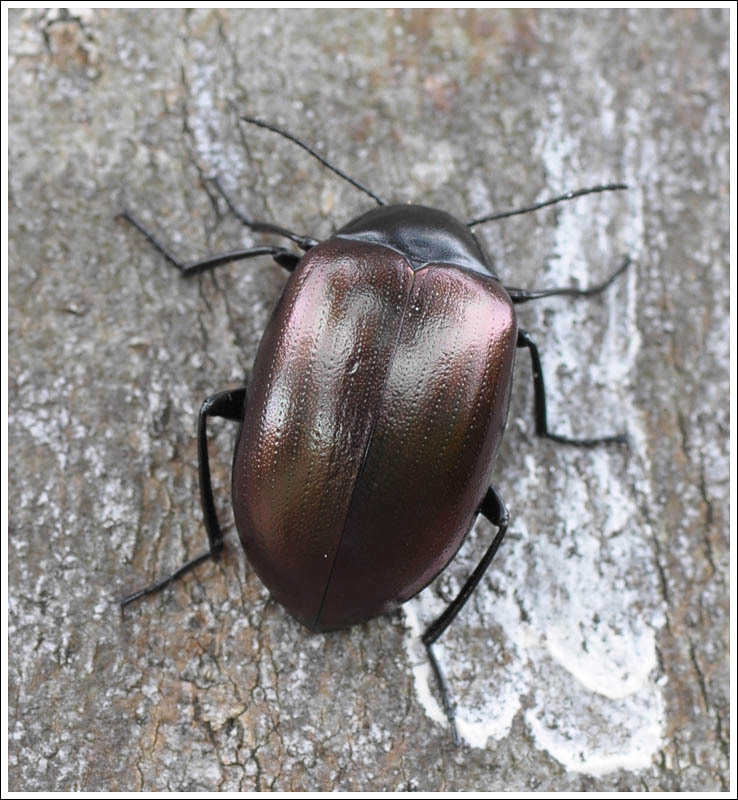 With the camera on the tripod and the beetle shaded, the resultant shot captured something of the subtle beauty of the species. 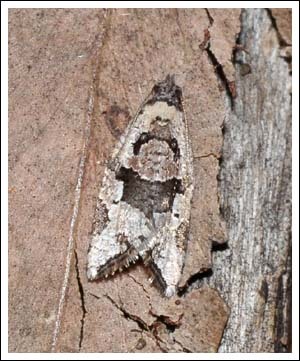 Posted on September 18, 2017 by TricarpaPosted in General Nature.